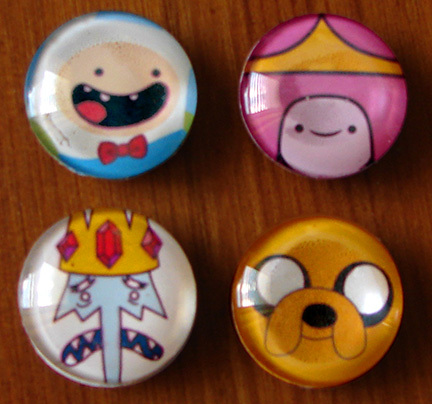 Here are some cute little “Adventure Time” magnets that I made for my niece’s fridge. She and her fiancé are big fans of the TV show on the Cartoon Network and I thought they might get a chuckle out of receiving a set of these for use in their kitchen. I think that’s it for my magnet-making mania for right now. There’s only so much Mod Podging one can do before sticky finger satiation sets in! I’m going to use the rest of the paper that I punched into 1-inch circles for envelope seals.